Alan Donovan had been fascinated with Africa since childhood. “My first scrapbook which I made at age 4 was all about Africa. It was mostly about animals,” says the man who’s now celebrating 50 years of Oshogbo art and artists with an exhibition at the Nairobi Gallery opening May 1st. Alan was meant to complete that celebration last October during the national Nigeria Day last October 1st, but he was already unwell. His condition deteriorated from then until early this year when miraculously, he began to recover and is now on the mend. So what if he’s now celebrating 50 years plus one since he first stepped foot on African soil, in July 1967. “I came initially as a food relief worker during the Nigeria-Biafran war. I was lucky since I was the last American admitted to the Nigeria Desk [of the US State Department] before it was shut down due to the war,” he adds. He admits his work with USAID in Biafra was depressing. But it wasn’t long after his arrival that he made his way to Oshogbo where he found a thriving village of artists and artisans, many of whom had worked in theatre for the so-called ‘thunder king’, the iconic Nigerian playwright, actor, director and musicologist Duro Ladipo who coincidentally is currently being celebrated in Nigeria since he died just 40 years ago in Ibadan, Oyo state at aged 45 years. Some of the young artists that Alan met at Oshogbo were by then either dancers, actors, electricians, sign painters or set designers for Duro’s theatre. The art of ten of those ‘young artists’ (who – apart from three who passed on -- are, like Donovan 51 years older now) are part of the ’50 Years of Oshogbo: the Art and the Artists’ exhibition that Alan assisted in assembling. But the show’s content has actually been curated by one of the ten, the brilliant Batik artist, Nike Okundaye (formerly Nike Seven Seven). Nike founded and runs the largest art gallery and artists workshop in all of Nigeria at Oshogbo. She’s been a close friend of Alan since those early days after she became the third wife of renowned Nigerian artist-musician and prodigious polygamist, the late Twins Seven Seven, whose art is also in the exhibition. Alan has long been a fan of Nike’s batik art and has given her no less than seven exhibitions of her own when he still had the African Heritage Pan African Gallery which he founded with the late former Kenya Vice President Joseph Murumbi back in 1971. In fact, so close are Alan and Nike that she was the only one out of the seven artists still living whose works are being exhibited who came across the continent last October to celebrate her country’s national day in Kenya with Alan. And while she won’t be able to return for the May 1st opening, Nike has already booked him a round trip ticket to come visit her gallery in Oshogbo when he is fully back on his feet. The three who died are Twins Seven Seven, Asiru Olatunde and Rufus Ogundele. The other seven are Asiru’s son, Y. Folorunsho, Bruce Onobrakpeya, Muraina Oyelami, Bisi Fabunmi, Jacob Afolabi, Jimoh Buraimoh, and of course Nike. Alan admits he is sentimental about his experiences in Oshogbo. “It was there that I was first introduced to contemporary African art,” he tells BD. “It was there that I bought my first painting by an African artist. 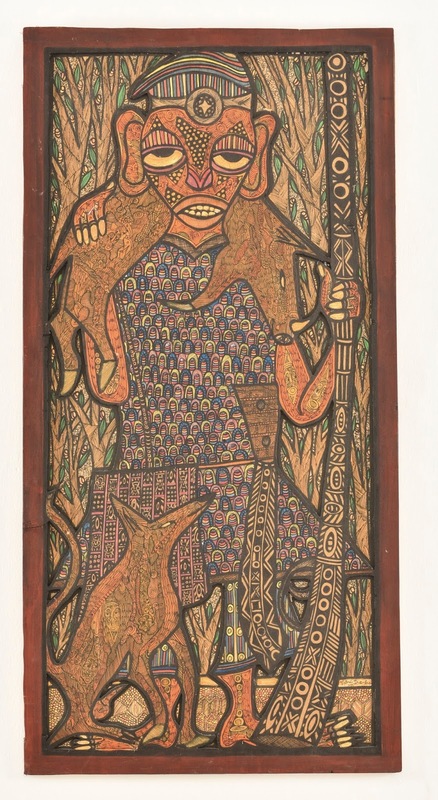 It was by Muraina Oyelami,” whose art has subsequently been exhibited everywhere from the Smithsonion Museum of African Art to the IWALEWA-Haus in Germany. So coming to Oshogbo was like the sunshine breaking through misty days when Alan couldn’t see the reality of contemporary African art. He said it was there that he first discovered “the inner soul” and source of creativity in Africa. It made such a profound impression on him that he’s been hung up on it ever since as one will easily see if they get to Alan’s African Heritage House in Mlolongo. Or if they get to the Nairobi Gallery from May 1st.